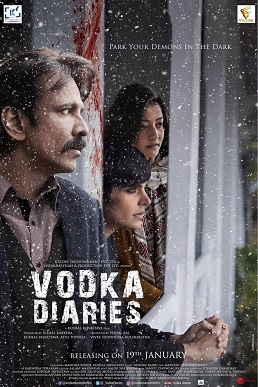 Highlight:- Vodka Diaries, a hotel in Manali, becomes the city’s talking point when it witnesses five murders. A suspicious cop Ashwini Dixit (Kay Kay Menon) is investigating the murder, but his operation comes to a screeching halt when his wife goes missing. Review:-Actually, Vodka Diaries is a story within the story. Kay Kay is disturbed, mentally weak. He acts rough, but the possibility of somebody manipulating him can’t be ruled out. He is battling his inner demons. In the garb of solving a murder case, he is also helping himself. He doesn’t want his efficiency to be questioned. Debutant director Kushal Srivastava opens the film on a promising note. An absolute normal cop talks about life, poetry and murders in the same breath with his assistant. It’s a mature take on human relationships. Nobody shows extra interest in anything. Life keeps moving at its own pace. His wife Shikha (Manidra Bedi) and assistant Ankit (Sharib Hashmi) form his world. He talks literature with Shikha and cases with Ankit. Suddenly, he realises that the case he is working on is more intimate than he initially thought. It becomes even more tedious when he starts meeting characters of his case in his personal life.